Ritual baths and floor washes are a tradition in Hoodoo as well as in certain religions. These can be done in several ways such as ritual cleansing baths on a person or spiritually cleaning a home, temple, or business. Ritual baths can include bath, incense, candles, floor wash, and prayers. Some are performed to get rid of energies that aren’t wanted like negative energies left over from fighting with a lover or friend or having an unpleasant family member over who leaves spiritual messes behind. It can clear a room in a matter of minutes but some messes could take longer to dispel of. For example, if you had a bad roommate living with you for years, that’s a lot of spiritual mess built up. It would most likely take some days to clean up the mess left behind. This is similar to Cut and Clear Spells, in which a set number of spiritual cleansing baths would be prescribed to clean out the energies lingering behind with you from him or her. The ingredients help to detoxify the body of toxins. Spiritual cleansing will cleanse your aura and re-balance your energies. There are many types of cleansings like Stop Gossip, Uncrossing or Unjinxing, Healing, or Protection. Ritual baths also consist of other intentions though. Some will take ritual baths for drawing love, money, getting a new job, increasing luck, or having prophetic dreams and visions. 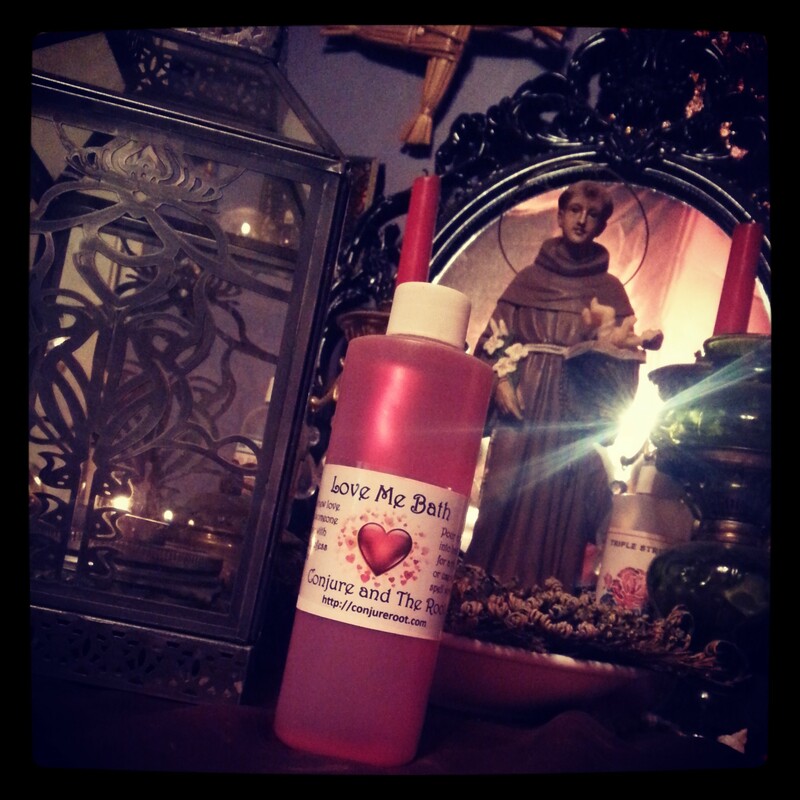 If you are looking to draw in love take the ritual bath with the appropriate bath supply to start your day and you will have the essences and scents of the magick on your skin as you mingle with your target. Of course there is more to it than just taking the bath, you include candles, incense, powders, etc. if you are doing a spell. I will share some examples later. Care and caution is important when using baths that contain essentials and herbs. There are two popular products for ritual bathing, bath crystals and liquid baths like bubble baths. Another way is to make a tea bath directly from the herbs and oils and pouring this into your bath water. Any way you choose is fine, not one is better than the other, it’s a personal choice. I tend to lean towards bubble bath style, even though the baths don’t really create bubbles, but it’s poured into the running water as if it were going to be a bubble bath. Once in the tub of water, prayers are stated depending on the intent, and the cleansing is performed. Just like dressing candles, washing away from head to toe downward motion is used when ridding of energies, and washing upwards from feet up to head when bringing in blessings or drawing energies to you. Traditionally the Psalms are used for the prayers, but I have wrote up my own prayers or used a prayer to a specific Catholic Saint. Candles are used, you can use plain white candles no matter what the intent is, or use green candles when performing a bath that involves money, and so forth. Ritual bathing might be done over a series of days in a week or month. Further, because this is a ritual, the remains are to be disposed of appropriately, like taking bath water to a crossroads or throwing out your front door or to a tree to absorb the energy. Here’s a typical method of performing a ritual bath for Uncrossing: Before Sun rise, run a hot water bath and add Uncrossing/Unjinxing prepared bath either bath salts, tea bath, or liquid bath. Light two white candles and set on sides of tub so that you will be standing between them. Step into your bath and pour the water over your head a total of 13 times and pray quietly Psalm 37, only wash downwards motion not upwards. When finished you may drain the water except a cup or bowl of it. Step out and air dry. At this point some folks will light the two white candles to stand in between them and smoke themselves with uncrossing or purification incense like frankincense. Once you have air dried yourself (no towel drying) dress in clean clothes and take the saved bath water to a crossroads turning your back to the rising sun in the east throw the water over your shoulder and walk back home not looking back. OR an alternative way to rid of the water is to take it to a tree trunk and throw the water at the tree so it may absorb the negativity. Let the candles burn out all the way on their own, unless you are going to repeat the uncrossing for a prescribed number of days, in which then you pinch out the candles not blowing them out, to reuse the following day. A simple Attraction bath would be similar to the Uncrossing beginning in the A.M. before sunrise. The exception is that you never wash the body downward, instead wash upwards, you can pour the water over your head a lucky number of times like 7 or 9. Recite Psalm 23 or another prayer of attracting your desires. Again air dry. Instead of white candles you might want to use yellow candles. Take saved water and throw in your front doorstep and sweep it toward your door to bring the attraction towards you. Or as in Uncrossing take it to the rising sun in the east at the crossroads, back turned to the sun and throw over your shoulder, walk home and don’t look back. These baths generally are the jump start of a major ritual working following whether it’s floor washing or spells. Floor washes are much like the Baths except they are used to cleanse and work on physical structures like homes, temples, and businesses. If a ritual bath has been performed and you are going to be cleansing the home as well, use some of the used bath water to add to your floor wash. Same rule of directing energies applies to floor wash application. Wash walls, doors, and windows from top to bottom when removing negativity. Wash from back of house to front door to remove the negativity. If bringing in luck, money, love, etc. the positive, the wash from front door, even the sidewalk if it’s a business, toward the place, and through to inside to the back of the house or business. Again, candles, prayers, and even incense can add to your ritual. One method I use for cleaning house is to pour my floor wash if it’s for luck or money into Pine Sol cleaner. Alternatively, I might use Ammonia or Murphy’s Oil Soap to cleanse out negative energies. Popular floor washes include Van Van, Chinese Floor wash, and Fiery Wall of Protection. Certain days of the week might be used for appropriate timing when cleansing with floor wash. I like to start my week off with a good luck floor wash added to my weekly chores. It’s a simple kill two birds with one stone technique! Here’s a simple method to using a floor wash for money drawing: Take Money Drawing floor wash in the early AM, pour it into a bucket of hot water and add Pine Sol cleaner. Begin outside of your front door and mop towards the front door and through it. Mop towards the back of the house in the motion of front to back covering the entire floor. Recite Psalm 23 as a basic good luck prayer. Wash the baseboards too if you can access them. If you have carpet however, I have instructed clients to use a broom and dip it in the bucket let the extra water run off and sweep in the front to back motion, covering as much area as possible. This is when you can really work those baseboards and doors and windowsills. Dispose of the water at a crossroads. To remove energies from your home you would use Uncrossing, Unjinxing, Spiritual Cleaning or something similar but start at the back of the house and work your way to the front door. Recite a purification prayer or Psalm 37. Easy as pie!